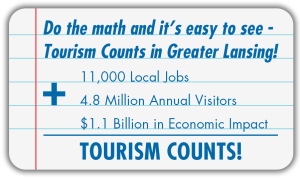 Do the math and it&apos;s easy to see - Tourism Counts! 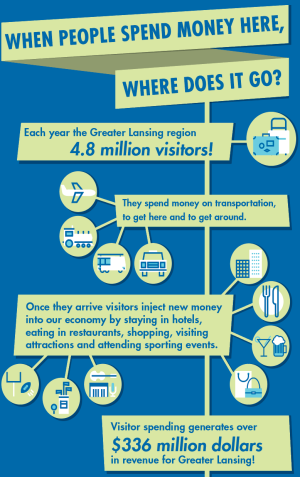 The Greater Lansing region welcomes over 4.8 million visitors every year, generating an annual economic impact of over $602 million dollars. While the influx of funds is great for the community, there is more. Lots of local jobs. Greater Lansing residents earned $336 million dollars in the tourism and hospitality industry last year and used those wages to make livelihoods in our community. Tourism helped provide significant tax relief for residents as well. Guests to the region pay taxes on fuel, lodging, food, beverages and much more. The total is an average of over $25 million in state taxes every year and over $504 million to the Greater Lansing GDP. These visitor dollars go into local budgets that help fund road repair, schools and marketing Greater Lansing as a place to visit. The stronger regional tourism becomes, the more it benefits the livelihood of thousands of residents and our community as a whole. Over 11,000 Greater Lansing area residents work to support visitors to the region. Standing along-side this valued workforce is a regional organization solely focused on tourism - The Greater Lansing Convention & Visitors Bureau (GLCVB). The Greater Lansing Convention and Visitors Bureau (GLCVB) is a regional, non-profit entity focused on bringing visitors of all kinds to the tri-county area. Also known as a Destination Marketing Organization (DMO), the GLCVB works with local hospitality partners to promote the Greater Lansing region to meeting and convention planners as well as leisure travelers.With over 50 years of experience in promoting Michigan&apos;s Capital City to the visiting public, the GLCVB has established itself as an economic catalyst and resource for tourists and residents alike. Be Part of the Effort! Keep Meetings in Greater Lansing! Are you a part of any hobbyist, professional or religious group that hold meetings that require event space or overnight accommodations? Next time, meet in Greater Lansing! Between the benefits of the Greater Lansing area and lots of free help from the GLCVB it&apos;s sure to be the best event ever. Not involved with any big groups that meet? Not to worry. Just having a positive attitude can really make a difference. The spirit of this community is reflected in its residents! Greater Lansing is the birthplace of Oldsmobile, the State Capital, and of course, Spartan Country. Show your community pride by knowing and loving where you are and making it a better place for travelers of every kind! A GLCVB membership won&apos;t just help strengthen local tourism; it will strengthen your business! Remember those 4.8 million annual visitors? They are potential customers looking for places to spend money! Reach them with an affordable membership which offers you exposure in promotional materials and numerous networking opportunities every year. Contact Melissa Nay at 517-377-1410 to learn more. 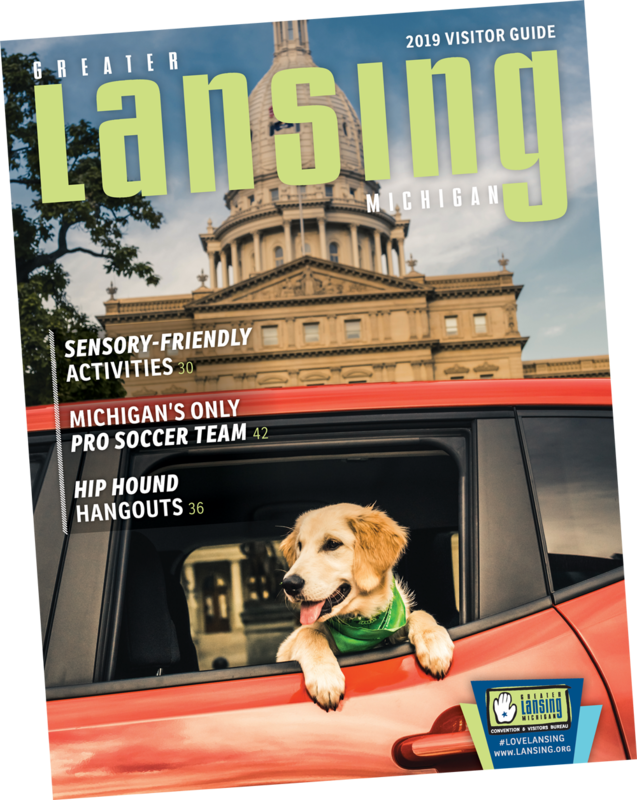 In 2010, the GLCVB, along with the Team Lansing Foundation, launched a program dedicated to improving the visitor experience in the region (the first of its kind in Michigan). The Greater Lansing Tourism Ambassador program is a nationally recognized program focused on equipping area residents and hospitality staff with best-of-class customer service skills and a detailed knowledge of the many assets in the region. Tourism counts - and so do great first impressions! Register for your CTA class today! For just $20 participants take a half day course and then an open book exam to become a Certified Tourism Ambassador (CTA). This well-recognized designation comes with a gold lapel pin and a lot of new-found pride in the region. 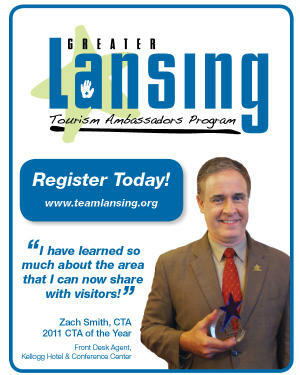 Visit www.teamlansing.org to learn more!